Moses Cone National Park  Only minutes away, this 3500 acre park offers two large lakes and over 32 miles of wide carriage trails for hiking and horseback riding. The Cone Manor House offers Southern Appalachian Crafts for sale and the Park Rangers provide presentations and hikes. Ask the Rangers about the weekly Cemetery Hike. Julian Price Park  Next to Cone Park. Over 4000 acres, it has a large lake for canoeing (rentals available) as well as great hikes along the Boone Fork River. Downtown Blowing Rock  Step back in time to this quaint town left much as it was in the early 1900's. Walk Main Street and visit the small shops, studios and fine restaurants. Or buy an ice cream, find a bench, and watch the people. Art in the Park  Hundreds of artisans and craftsmen display and sell their handiwork in downtown Blowing Rock. Once a month from May through October. Horn in the West  An outdoor drama performed in Boone NC with a season from mid June until mid August  nightly except Mondays. Portrays the history of the area in an entertaining fashion. Golf  The Boone Golf Club and the Mountain Aire Club in West Jefferson are two of the best public courses in the area and well worth the trip. The Hawksnest Club is also available plus several other clubs in the area. Blowing Rock Stage Company  Professional theater productions are presented from June through September plus holidays. Grandfather Mountain  Great for hiking. Features the "Mile High" swinging bridge (one mile above sea level that is). Great views. Also a zoo with bears, otters, eagles, deer, mountain lions, etc. Nice Museum with spectacular gems. Linville Falls  Spectacular views of the waterfalls and gorge. Great hiking too in one of the most rugged areas in the East. Linville Caverns  Guided tours through a natural limestone cavern. Blowing Rock Charity Horse Show  The oldest horse show in the nation. Riders come from all over the East to participate. Hunters, Jumpers, and Saddlebreds. From late July through mid August. Symphony  The North Carolina Symphony performs outdoors usually in late July. Skiing  Appalachian Ski Mountain is only minutes away. Beech Mountain and Sugar Mountain are about 45 minutes away. Ski Schools and rental equipment are available. White Water Rafting and Kayaking  Several outfitters offer canoe and rafting trips from May through October. There are several great rivers to tryranging from easy to difficult. Fishing  Excellent fly fishing in season. Many lakes offer good fishing spots as well. Several outfitters nearby can show you the best locations. Chetola Lake is stocked with trout five times a year. Hiking  Great hiking throughout the area. Our favorites are the Boone Fork Trail, Grandfather Mountain Profile Trail, Lookout Tower Trail from the Moses Cone House, and hikes in Linville Gorge (hard). For easy walks, nothing beats the trail around Bass Lake. Shopping  Downtown Blowing Rock is quaint and has a number of shops. The Shoppes on the Parkway (Tanger Outlet) at the edge of town have many national outlets. A "must see" is the Mast General Store in Valle Crucisan original country store in continuous operation since the 1880's. Blue Ridge Parkway  Less than a mile from town is the Parkway. This is the most beautiful motor road in the country. Great for scenic drives, beautiful vistas and picnics. Don't miss the Linn Cove Viaduct. Appalachian State University Offers cultural and sporting events year round. The largest university in western North Carolina. Highland Games  These Scottish games last 3 days in July at Grandfather Mountain. Traditional Scottish sports and festivities are unique and draw people from many states. Oktoberfest on Beech This autumn event brings a touch of Germany to the mountains. Woolly Worm Festival  This popular event is held one weekend each October. Woolly Worm races are held throughout the weekend (great for kids). The winning Woolly Worm predicts the weather for the winter. Food and craft tents surround the event. 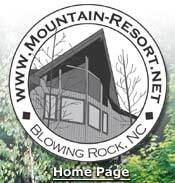 Fine Dining and Entertainment Blowing Rock, Boone and Banner Elk have a number of highly rated restaurants. You will not be disappointed in the food. Horseback Riding  The Blowing Rock Equestrian Preserve guides trail rides from May through October. Yonahlossee Stables offer indoor and outdoor riding lessons as well. Tweetsie Railroad  An amusement park which features a ride on the famous Tweetsie train. Entertainment, rides and a petting zoo make it fun for kids of all ages. Ten minutes from Blowing Rock.